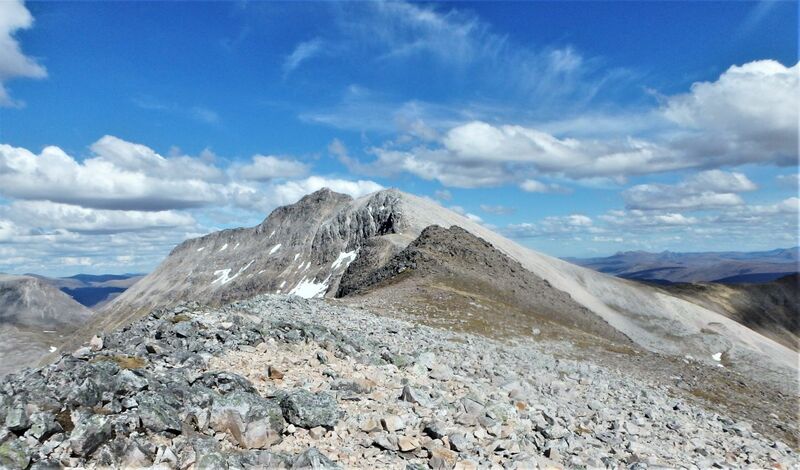 Our trip to Scotland in 2017 had been blessed (mostly) with good weather, but my day on Beinn Eighe (see post #230) had included a bitterly cold wind that didn’t encourage hanging about, and I wanted to see a bit more of the mountain and to enjoy it at a more leisurely pace. 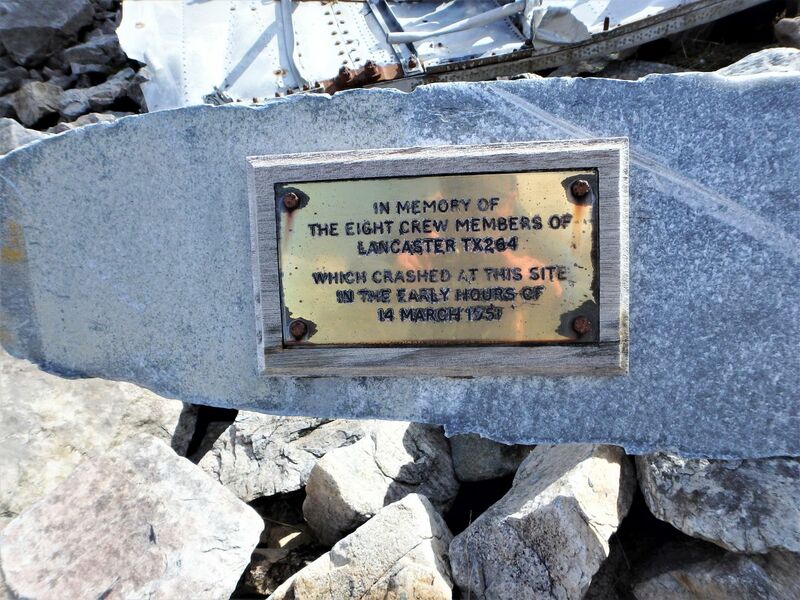 Almost a year to the day I was back again, with plans to spend a bit longer visiting the site of the 1951 aircrash (see post #227). 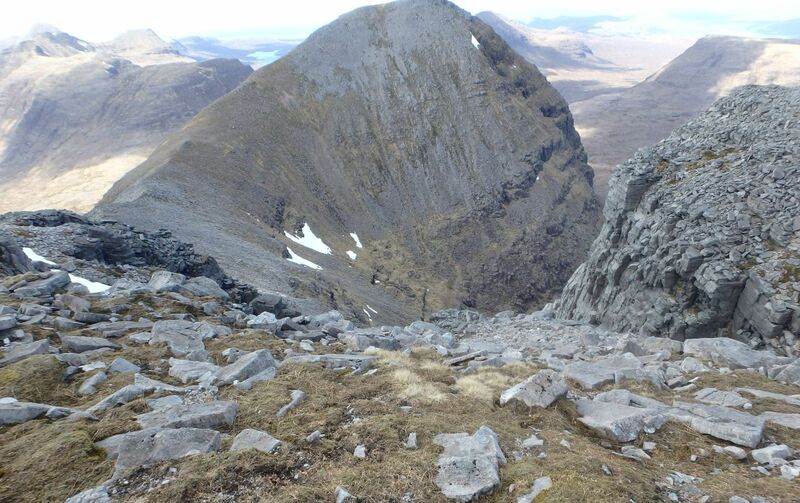 Liathach (left) with the route to Coire Mhic Nobaill on the right …. 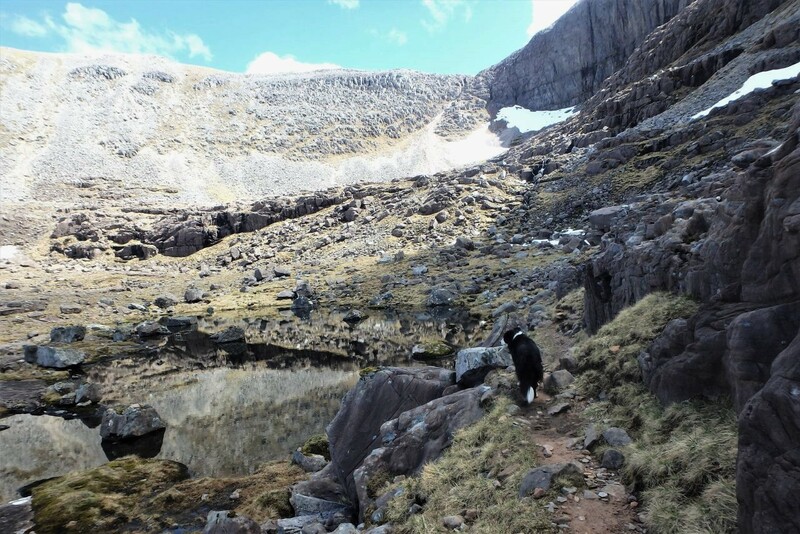 The walk out to Coire Mhic Fhearchair is worth doing for its own sake, passing as it does through magnificent mountain scenery and ending up in one of the most dramatic corries in Scotland. 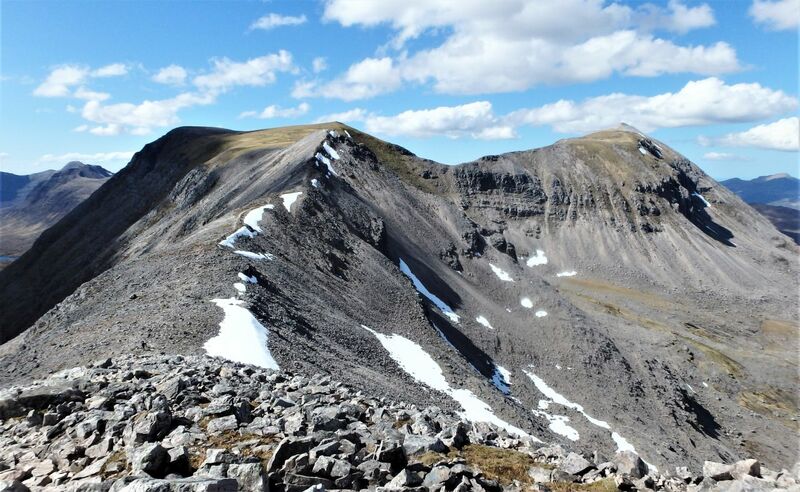 The route passes through Coire Dubh Mhor, a pass between the mighty Liathach and Sail Mhor on the Beinn Eighe Ridge, before turning the corner to go round Sail Mhor for the ascent up to Coire Mhic Fhearchair. 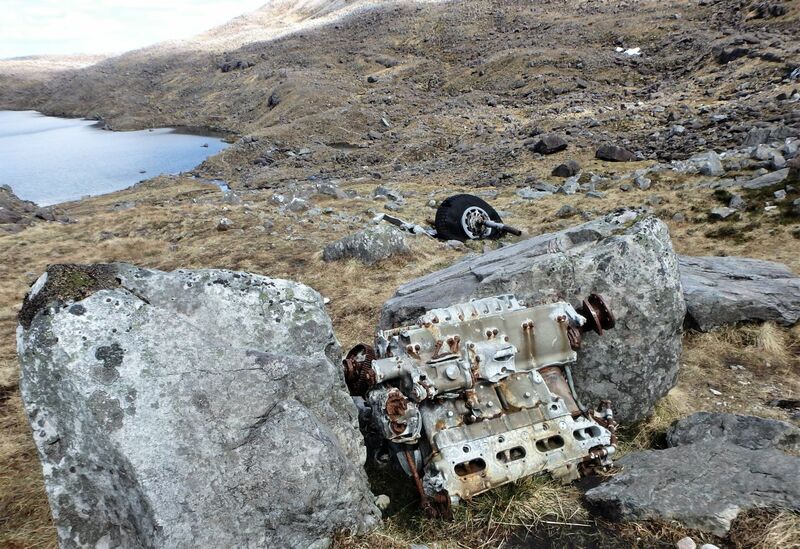 One of the four Rolls Royce Merlin engines …. 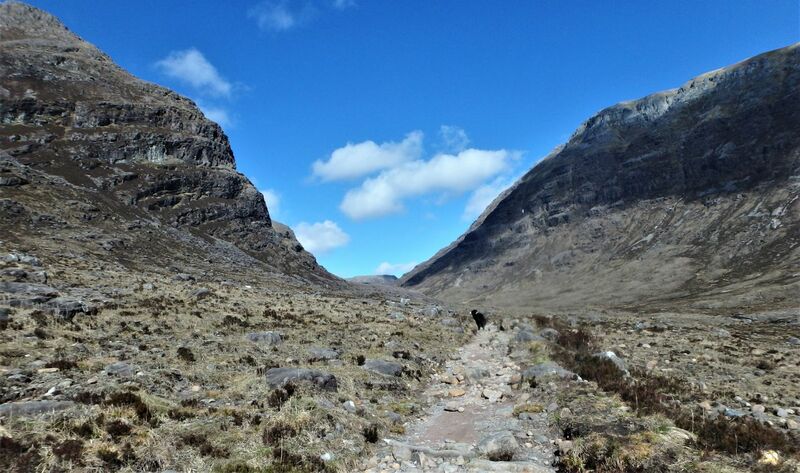 The most striking feature of the corrie is the cathedral-like Triple Buttress. 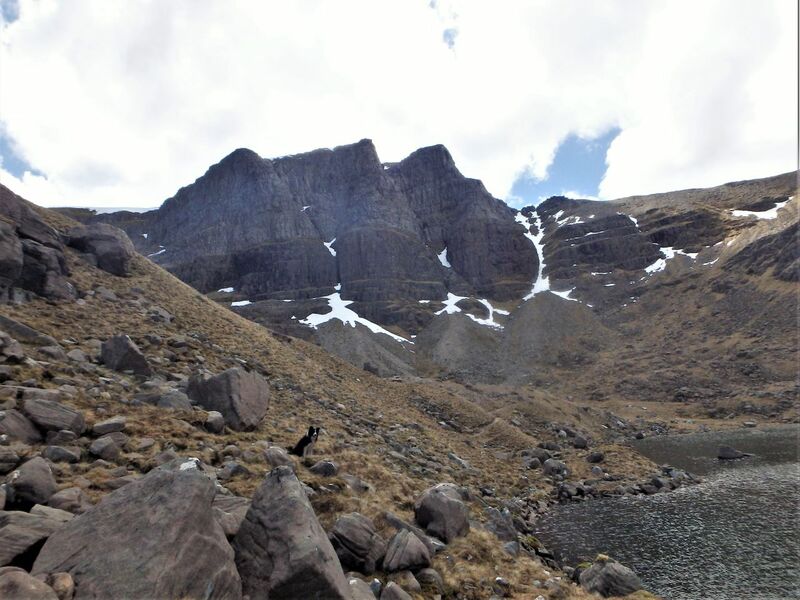 In March 1951, an Avro Lancaster maritime reconnaissance aircraft struck the right-hand side of the buttress just below the summit of Coinneach Mhor. 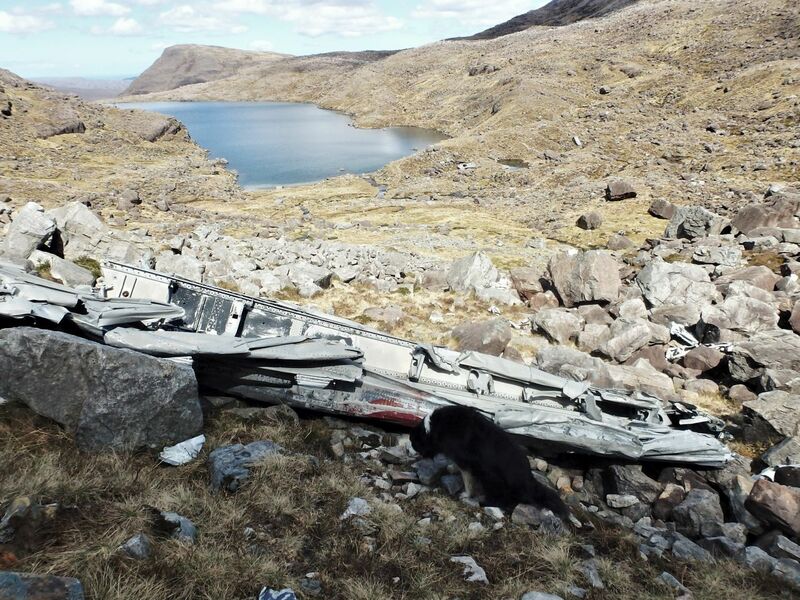 All eight crew members were killed, and it took five months of working in sometimes appalling weather conditions for the rescue team to recover all the bodies – the wreckage is a poignant memorial to those who died. 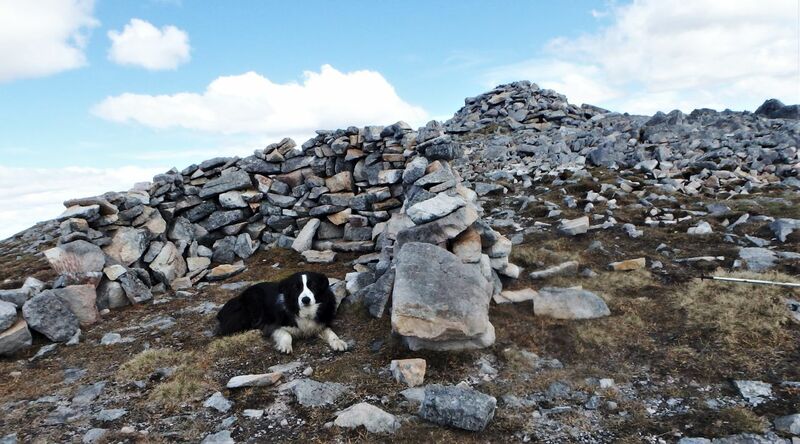 On the high traverse path …. 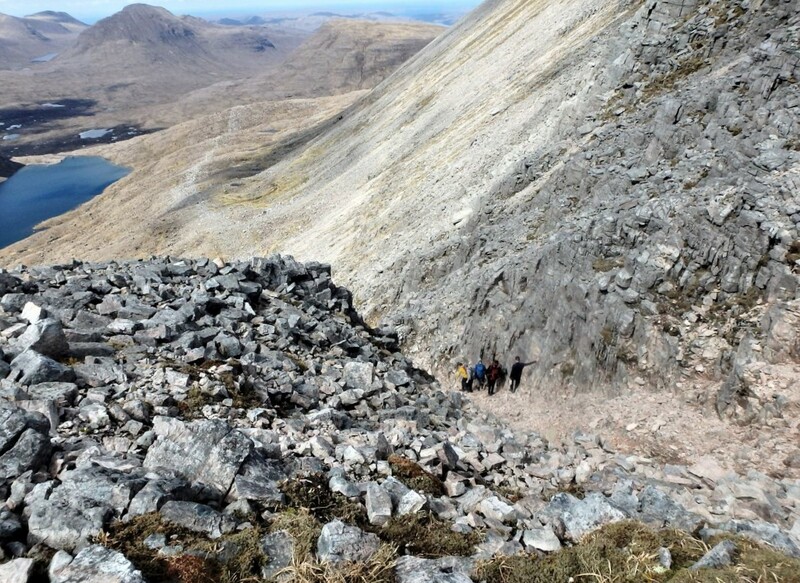 The next task was to regain the path from the loch which heads up towards a steep scree gully. The way across was straighforward, though ‘Mist’ did need a bit of a shove up a big rock step – the rest of the time I was trying to keep up with the collie! 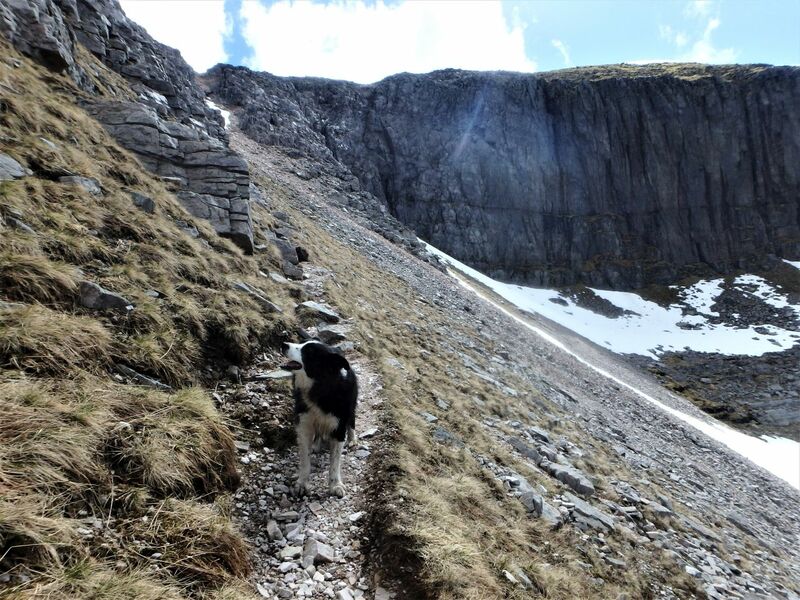 I stopped for a quick bite before taking on the top of the gully, which gave the dog a great opportunity to mug me for a sandwich. The final section was short, and a descending party was considerate in waiting for me and ‘Mist’ to get out of the target area before they moved. 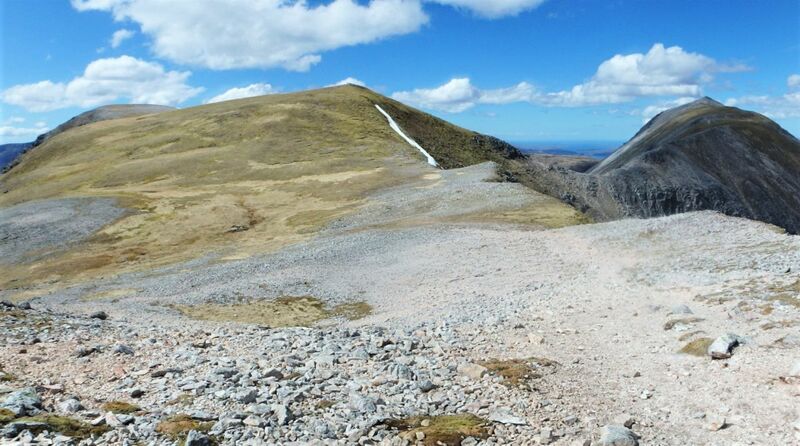 Looking towards the top of Fuselage Gully from the summit …. 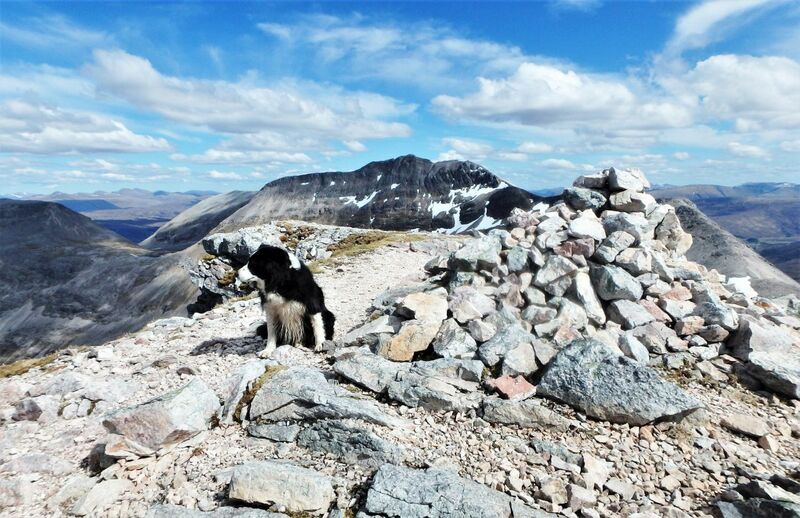 I had given the summit of Coinneach Mhor a miss on the previous visit, as the sharp, cold wind had made hanging about unpleasant. 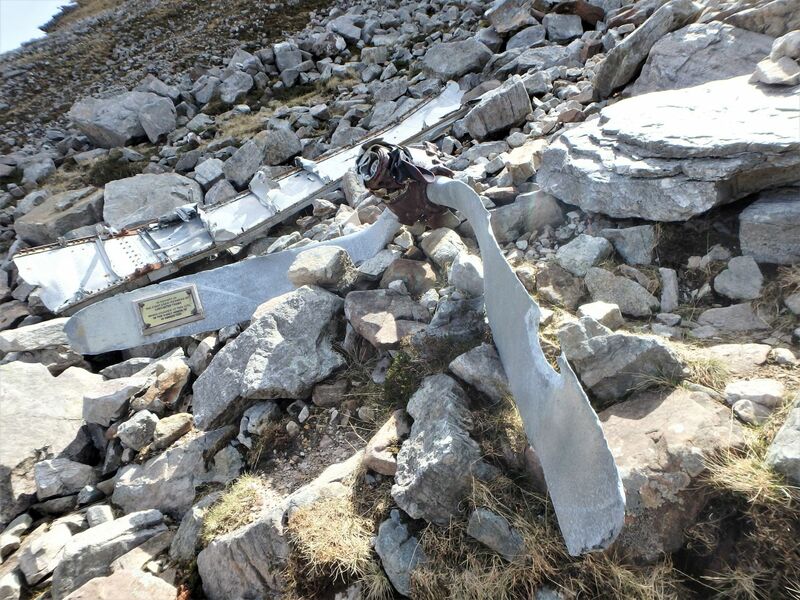 This time I had a wander over to the summit and peered over the edge down towards the crash-site – if the aircraft had been just 10 metres higher it would have missed the mountain. 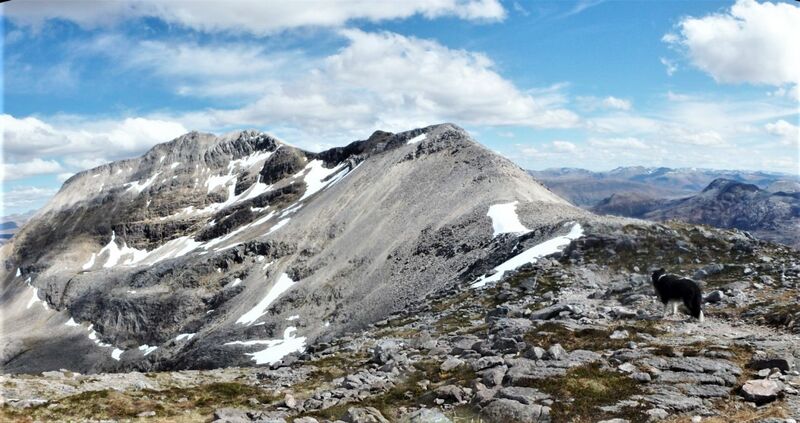 Further along the Beinn Eighe Ridge with Spidean Coire nan Clach getting nearer …. 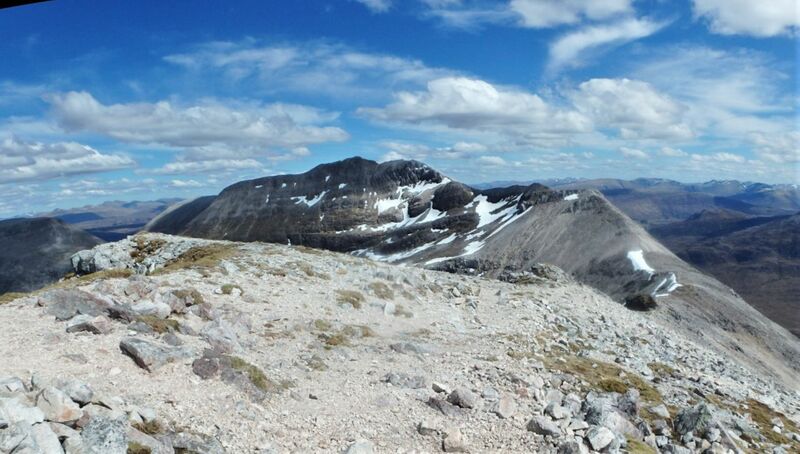 The rest of the trip along the Beinn Eighe Ridge was pleasant in the warm weather. 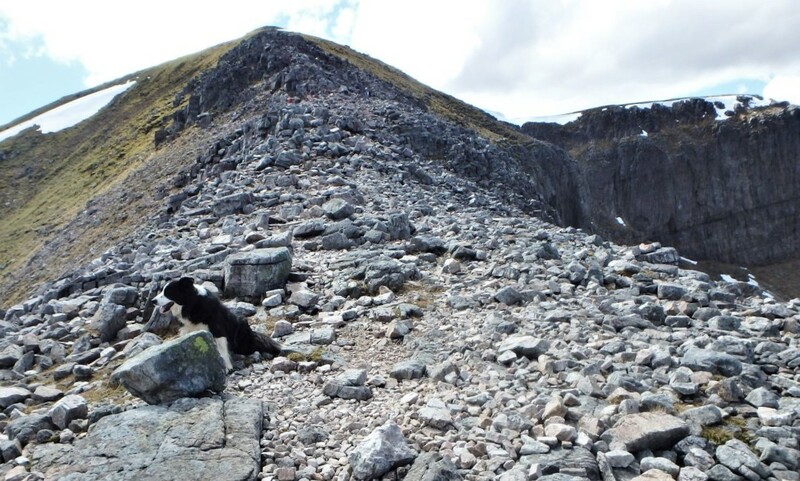 I had thought about a different descent route from Spidean Coire nan Clach, following a comment on the earlier post by fellow blogger Mountain Coward – her walking companion had taken a nasty tumble on the steep section of the usual descent. 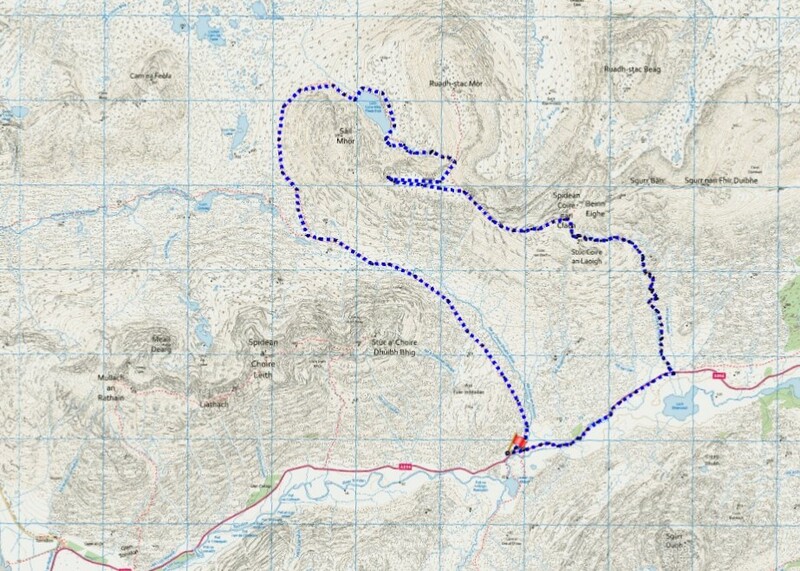 In the end I decided on the route I had done before as I already knew the ground. 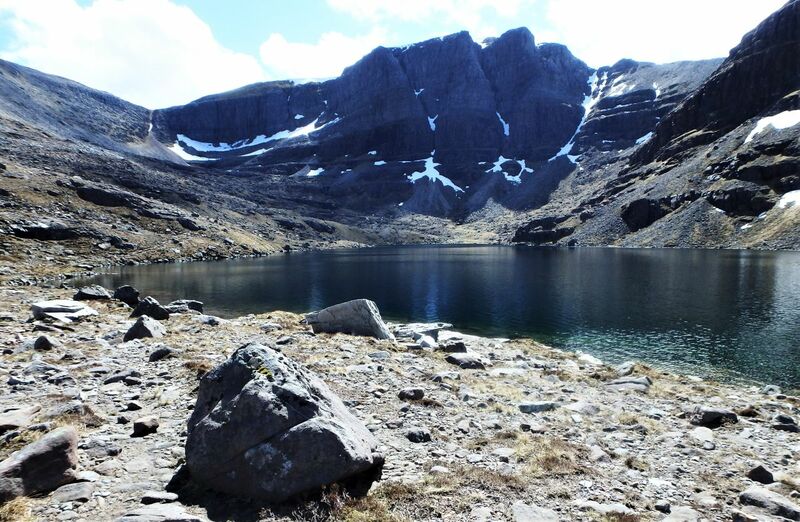 The final ascent to Spidean Coire nan Clach …. …. 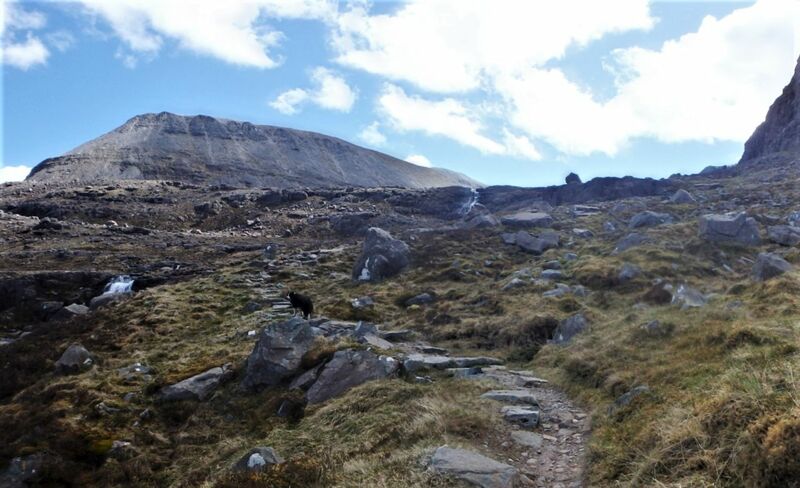 and the start of the descent …. 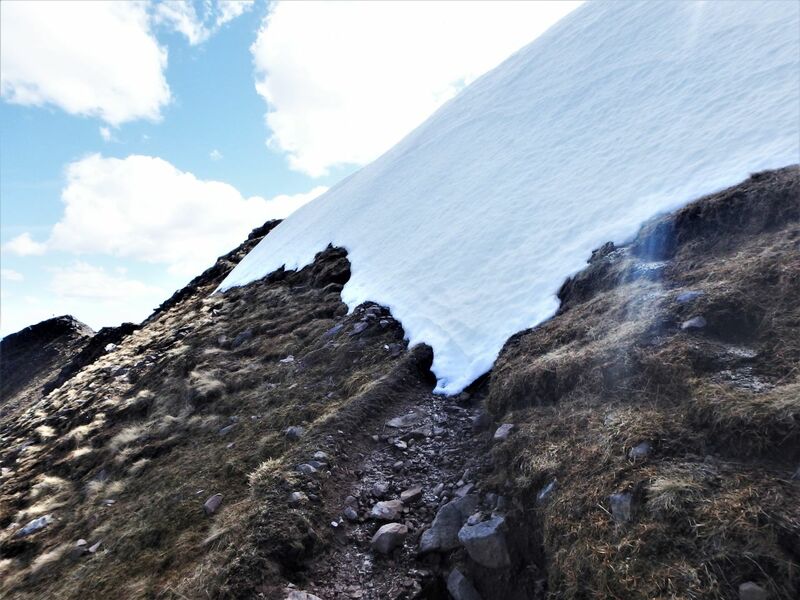 It wasn’t quite as I found it previously though – a cheeky little snow wall obscured the start of the path, though this was easily by-passed. 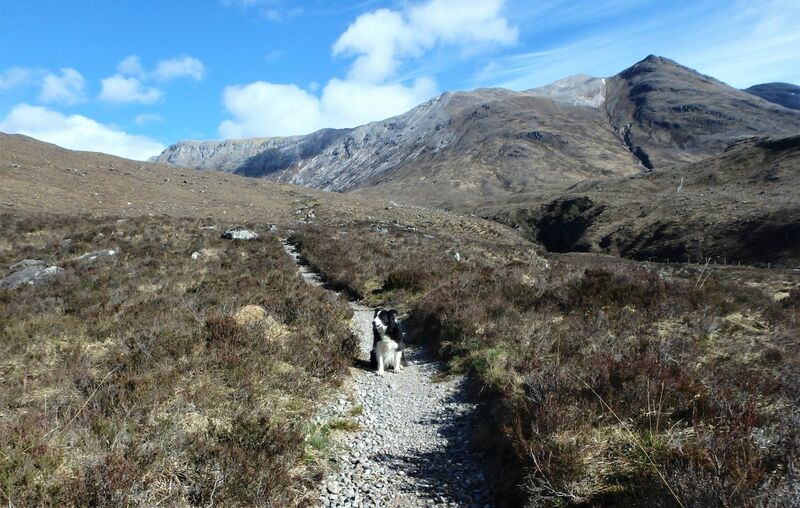 From there it was downhill all the way before a 2km road walk – ‘Mist’ would have to hang on for dinner time! p.s. 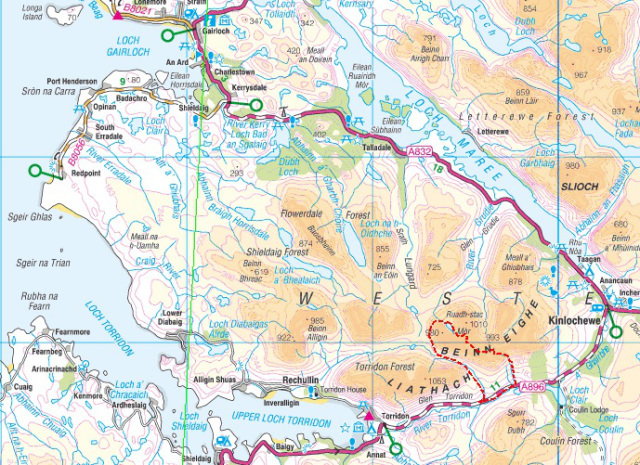 – I’m probably not finished with Beinn Eighe – there’s much of the mountain I haven’t seen yet. This entry was posted in 1. 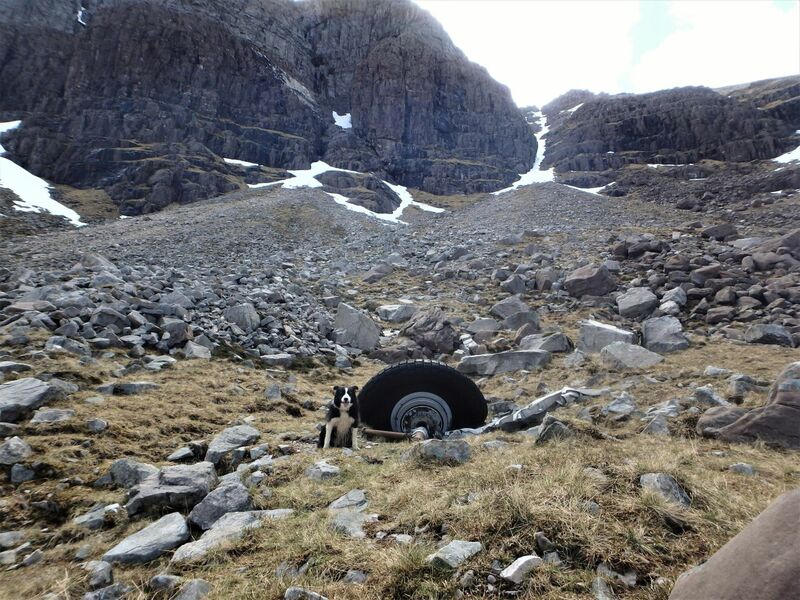 Scotland, Aircrash Sites and tagged Border Collie, hillwalking, mountaineering, mountains, photography, Scottish Highlands. Bookmark the permalink. It’s a mountain which photographs well on a nice day doesn’t it? 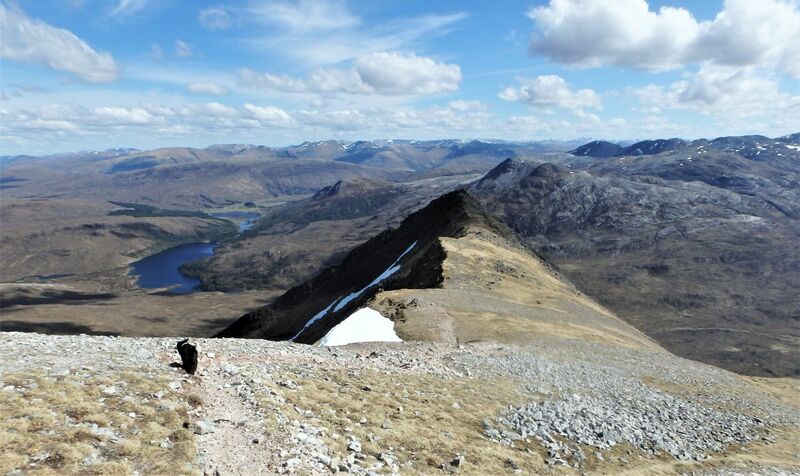 So did you go down my suggested ridge or the ‘upside-down’ corrie in the end? 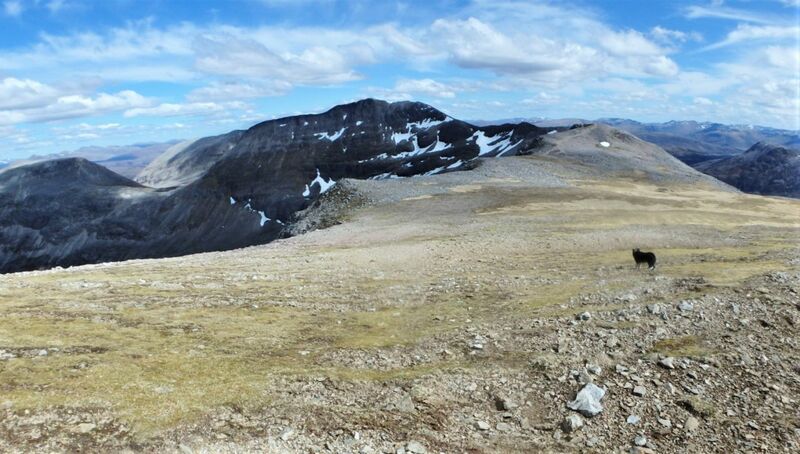 Also, I’m confused by how you go up onto the ridge – did you somehow find a path which misses out the horrible scree gully up to the ridge? If so, I’d be interested in the details! What a beautiful day you had. 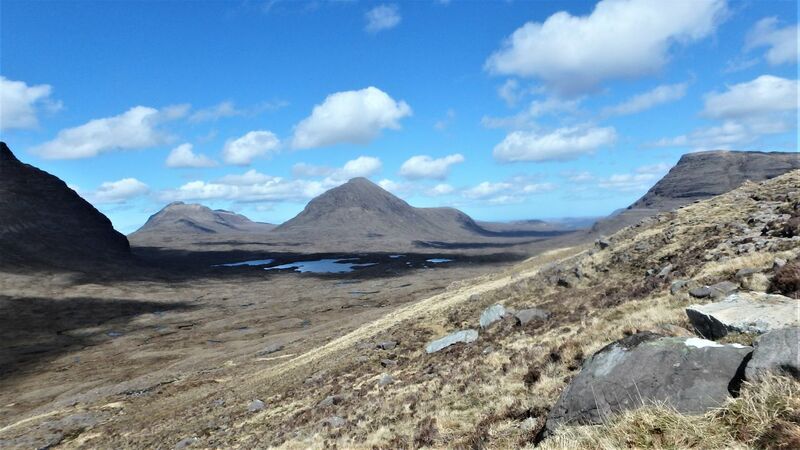 Your images hint at the vastness of the Scottish mountains. A great gallery of images, Paul.